Gill and Doreen attended the Half-Yearly Council Meeting on Monday 21st March in Kendal Town Hall. 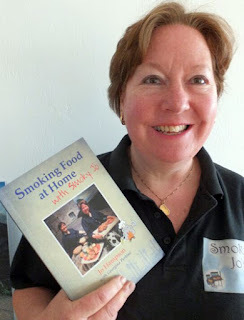 Following the business and reports from different sub-committees, Jo Hampson entertained us with the story of her time running the Old Smokehouse at Brougham Hall. There were many amusing anecdotes. She also told us how to smoke food at home and about the courses she and Georgina run at Smoky Jo's. We must not forget that she now also runs the chippy in Shap and she recommends the smoked haddock on Thursdays!